How do you start an essay about the places you miss while traveling? Rolling along a two-lane highway as it becomes dark is a good way. As you slip beyond the scenes of daylight, your awareness imperceptibly closes in on you until the oval of light from your headlights is your entire world. The highway center-line stripes brighten as they slide by your left knee, keeping a hypnotic rhythm as you fight to stay alert. You see the occasional shadow of a grayish body slipping across, almost out of sight on the edge of your pavement pool save for a momentary flash of eyes, cautiously regarding your progress, shimmering like a pair of reflectors in the ditch. The rhythm lulls you and you reach for the chewing gum and start looking for a friendly gas station with a tolerable cup of coffee. Then you know you are missing things. 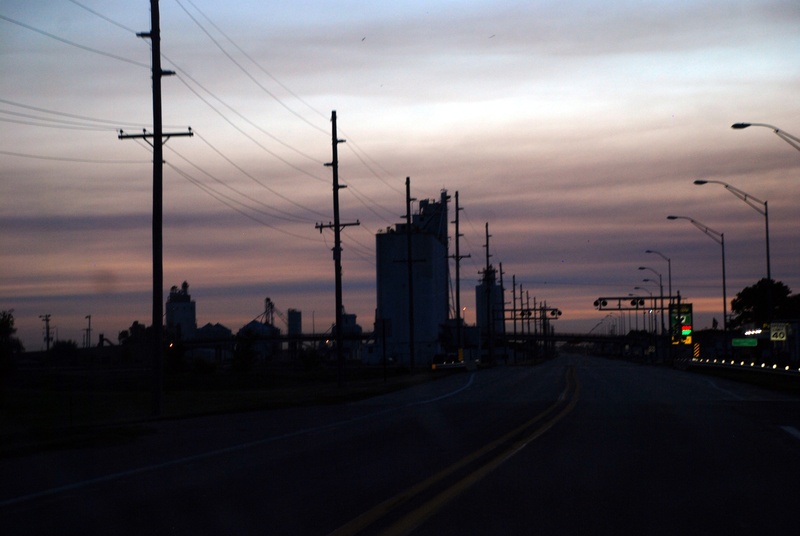 If it were not for a fortuitous change in our schedule on the way out, when of course we had no time to stop, I would not have known that this inconvenient sunset would obscure two elevator sites. Usually on this trip, this highway is where we stretch the mileage after dark until we can go no further. It is true whether we are starting from camp and stretching the return trip past Ogallala, or rolling from Ashland and hoping to make it as far as Torrington, on the way our hunting spot beyond Lysite. Somehow, the view on this road is only as wide as the pavement, every time. On other trips the stopping spot has been Sidney, where we stay the night, then in the morning we drop into the Cabelas on the way toward Casper for last minute items like socks and bb’s. On our return trip, we overnight in Sidney again to visit Cabelas to get the stuff we forgot so we have it for next year (of course by that time, the new stuff has been misplaced and we go through the whole routine again). On those occasions we bypass this road altogether. On our way back through–this time, after dark, Llewellyn is the first newly discovered elevator site we see. The old wooden house stands hard by the road with bins lined up on either side. A Purina checkerboard shows faintly in the darkness, but a photograph is out of the question. We are pushing the miles, and the setup for this dark building would be time consuming and the results would be marginal, so we pass it by. I note the town for future reference, for that imaginary trip when we will be rolling through in full sun with all the time in the world. 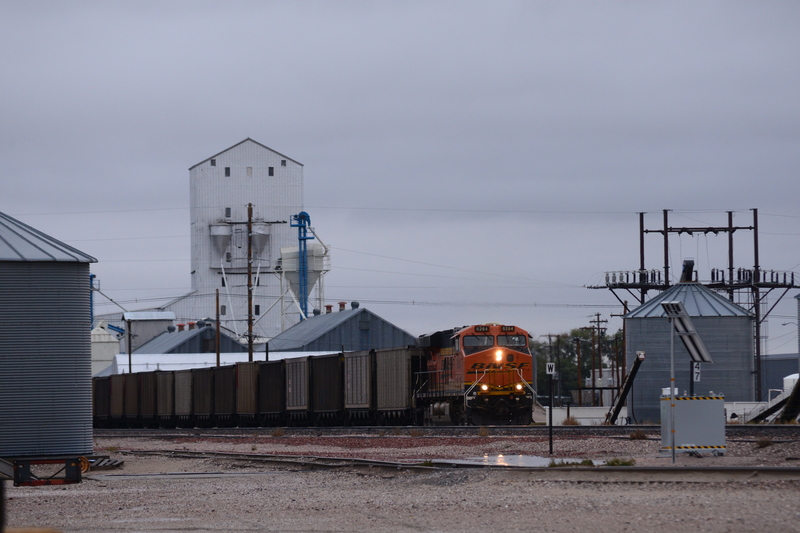 The second elevator location comes into view when we are just about at the end of our rope in Ogallala. I have gone through a pack of gum, and I have made reservations for a motel somewhere nearby for the night. We are stumbling in past midnight. 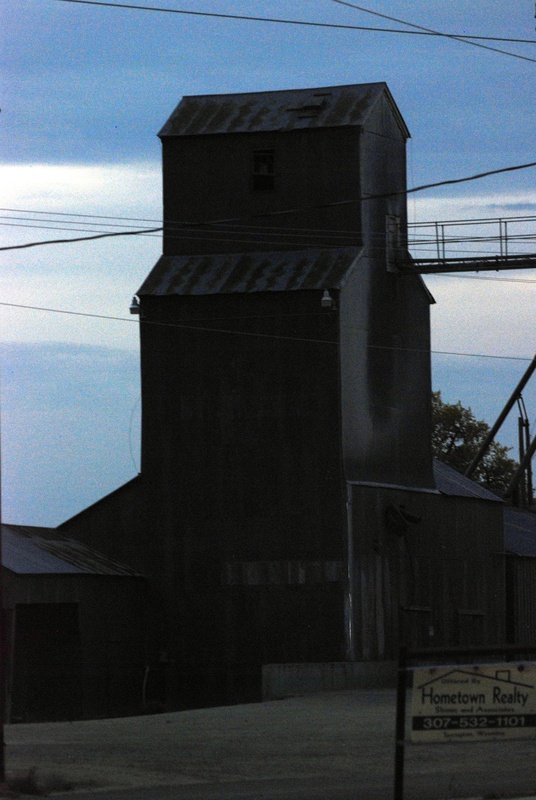 One old wooden elevator displays a Nutrena sign from it’s spot at the end of a short lane, where it nestles among round bins and bathes in dimly yellowish artificial light. As we roll across the viaduct in town, which takes us over the tracks, we see another silvery old-timer on our left which looks intriguing. I will have to check these elevators later. In the morning, all is forgotten as we get on our way toward Ashland. This is how you leave a patch of geography perpetually obscured in darkness, and scarcely notice its absence. The absence doesn’t breach your consciousness until you notice what is missing, and that can take a long time. I spend my professional life flying across the continent in the dark, with things like the Grand Canyon and the Rocky Mountains passing below unremarked. A scattering of lights strewn across the land are all the clues to life below—like droplets of water on black velvet, illuminated by an unseen light, they twinkle and tease. The familiar cockpit lights are my entire world with little else to distract—the gum to keep me alert, or coffee sometimes, and a cozy hotel to look forward to. 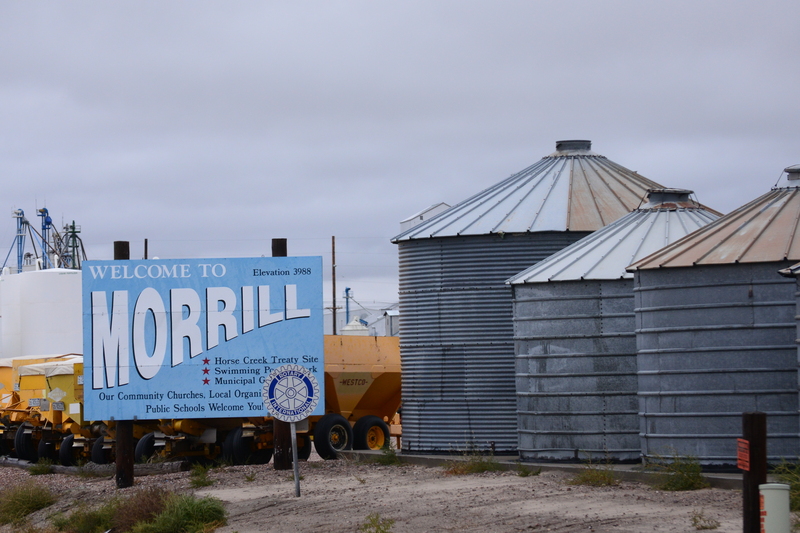 This entry was posted in Miscellany, Photography and tagged grain elevator, Lingle Wyoming, Mitchell Nebraska, Morrill Nebraska, photography, travel. What a romantic story of the heart of America… Excellent writing as well as the photography. 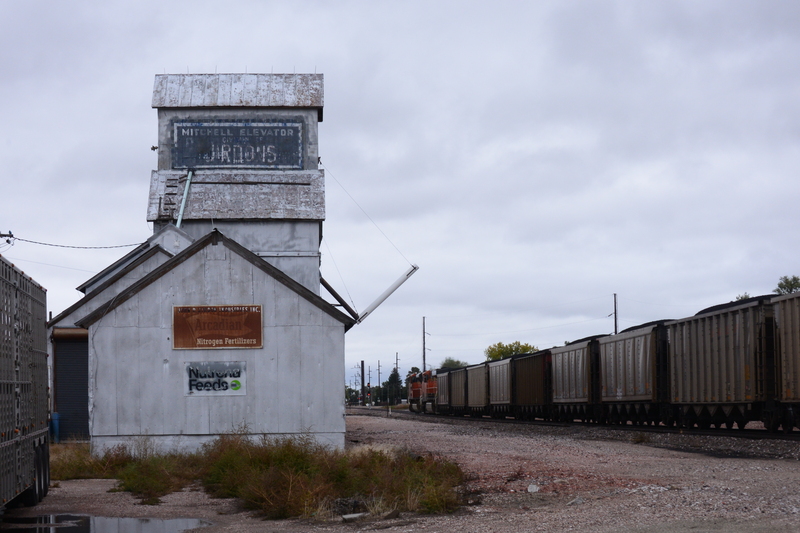 I loved the locomotive shot in Morrill… Days long past. Thank you, my friend. That is a fine compliment, especially coming from you. Have a great Christmas season.